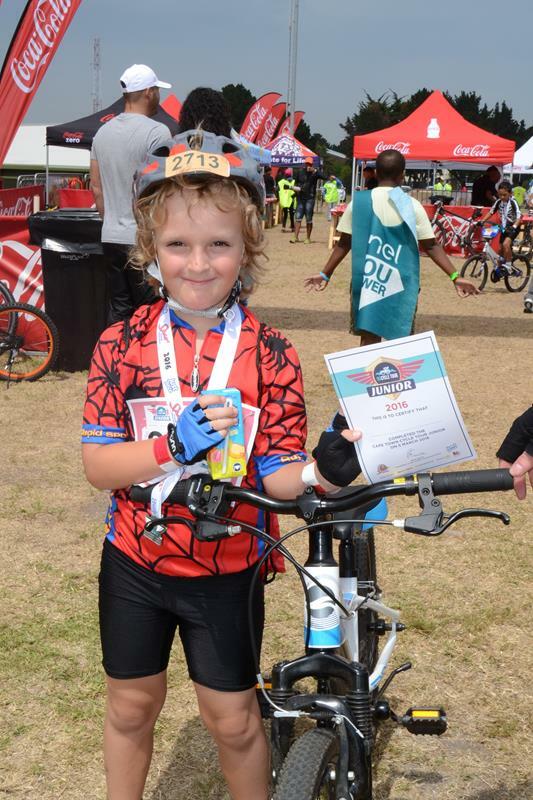 My body is now sufficiently recovered to sit at a keyboard long enough to jot down the tale of an unexpectedly eventful Argus weekend (and yes, I know, it is now more correctly known as the Cape Town Cycle Tour). 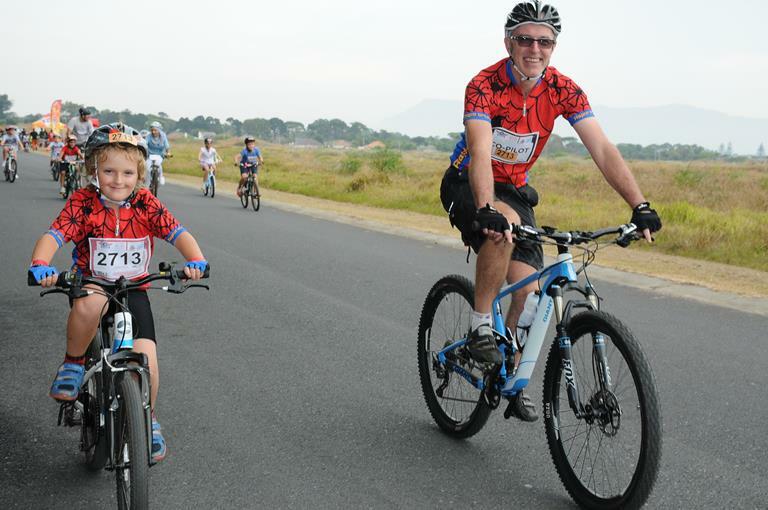 Our move to South Africa and the Argus are inextricably intertwined with my passion for road cycling. I’ve ridden every edition since that first one in 2008 and, come September, I sit eagerly at the PC waiting for entries to open without ever questioning the decision to ride it again. In the last three years that tradition has evolved to the extent that I’m almost more enthusiastic about the shorter, but equally enjoyable Junior Cycle Tour. Riding 2.5km laps (three of them this year) around a decaying military base doesn’t seem like a recipe for cycling heaven but it’s not really about where or how far you ride. 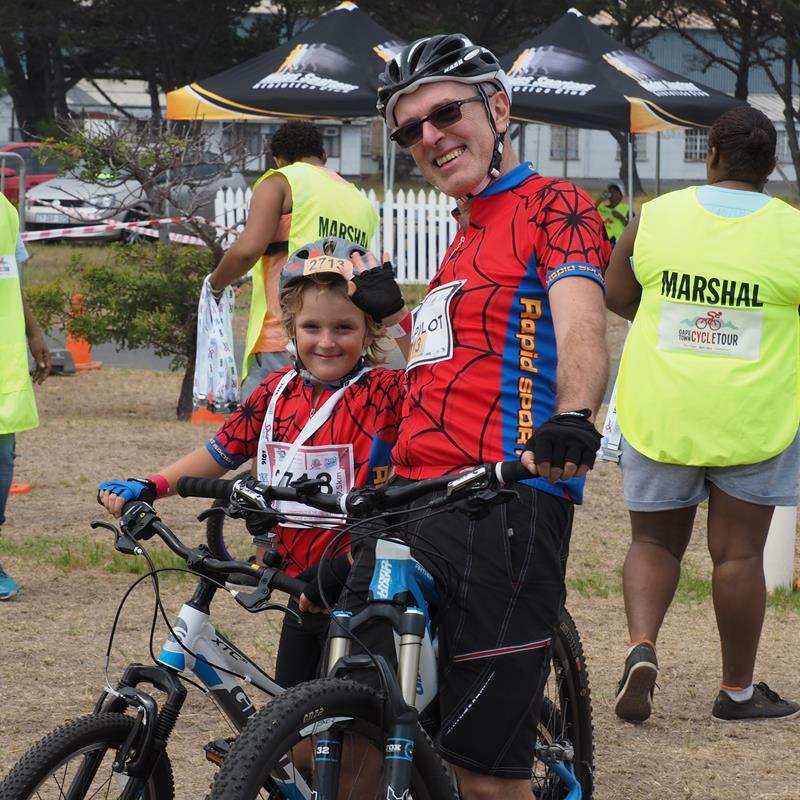 It’s a family fun day where the kids get to share their own adventure out on the bikes with their (generally cycling obsessed) Dad, or Mum, or in some cases both. And the organizers pitch the whole event just right – bouncy castles, face painting, a pimp-my-bike stall, and regular tannoy announcements that it’s a fun ride not a race. The latter is sadly, unheard by a few over competitive parents or older siblings. There are no timing chips, and no first or last place, but a handful still insist on racing as if some major prize were waiting at the end. The start tape drops, and bikes buzz left and right as a dangerous concoction of inexperience, speed, adrenalin, and too many sugary drinks are rapidly mixed together. For those first few minutes, it’s almost more scary than the start of the full Cycle Tour. Whether b y nature or nurture, Ben seems to have inherited mine and Yolandi’s natural sense of caution and he was visibly freaked out by the whole circus. He’s also growing up to be very capable and headstrong and knew exactly how he wanted to cope with that. Eyes fixed straight ahead, he rode carefully, and waited patiently until the mayhem died down. By the time we rounded the first corner and passed the drinks stall it was already becoming less chaotic and more pleasant. He put away the serious face, relaxed, and became his naturally chatty self again. I forget our exact topics of conversation as we rode around and around. Some of it was definitely about what gear he was in – he gradually built up speed and shifted up from 3rd where he started, to 5th by the final lap. 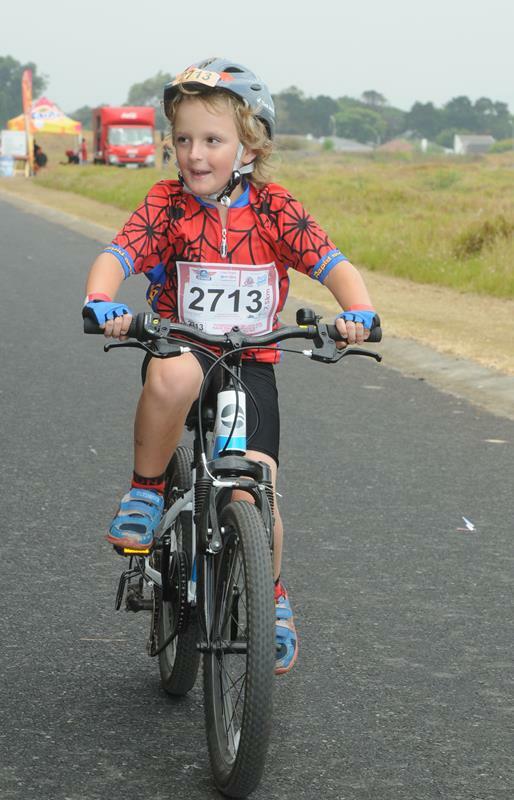 It’s hard to believe that only 2 years ago he rode just 1.7km with Yoli jogging along beside – and now he’s on a bike with gears and riding confidently. Yep, no question, when those entries open next year – we’ll be waiting in the queue to book our place. Worth it just for those few short words alone. I’ve never doubted my desire to enter and ride the Argus, and I didn’t do so this year either. But in the week building up to the big day a nagging voice had been filling my head with premonitions of doom and gloom. Not general ones either, very specific ones about the risk of high speed crashes on the Blue Route – the fast section between the top of Edinburgh Drive and Muizenberg. I even mentioned it to a couple of people too, including my sports masseuse Andre Brand at my pre-ride loosener session. At 4:30am when the alarm went off I actually had to give myself a pep talk – it was all just nerves, and that was not a good enough reason to miss one of my favourite rides of the year. That talking too clearly wasn’t quite strong enough. Hertzl, Theunis and a few other friends I saw on the way to the start chutes later remarked how I’d wished them a safe ride and to take care on the blue route. As our start group (2E, 06:53) surged away I was glad of my altered race day routine. For the first time, I’d done a few laps up and down Long Street to loosen the legs up. It was a great help at staying with the front of our group as they charged up the N2 towards Hospital Bend. It’s a tough call whether to ride hard early or take it easy over the opening stages and jump on the back of a fast group once the legs are warmed up. I was surprised how the earlier start time made the road feel more empty, and glad of having warmed-up legs to go out hard with my bunch. I was a few meters back from the head of the 2E bunch, but beyond them was clear roadway until the tail of the next group – 2D or maybe even some stragglers from 2C. There were riders either side of me, but not nearly so densely packed as I’m used too from later start groups. Aside from the odd rogue rider cutting in or not holding their line it seemed a lot less chaotic than I’ve experienced in the past. Whether that impression was real or imagined, one thing beyond doubt was our speed. I don’t recall the exact Average Speed reading as we crested Edinburgh drive, but it was well above 30km/h (I think it was around 32). In my best years, it’s been around 28km/h at that stage. Adele Nolan from our club was still close by in our group – we alternated places a couple of times as the speed picked up heading down the Blue Route proper. I didn’t see Theunis at all, but I knew he wouldn’t be far behind us with the strength and speed he’s developed this year. My memory to this stage is very clear – there’s a very slight incline in the middle of the Blue Route and I recall that this, combined with a fresher than expected head/cross wind dropped our speed noticeably. The group stretched out and narrowed as riders began to paceline, looking for the slipstream of other riders to lessen the workload. We were rapidly overhauling the tail of the group ahead too. Our group now stretched maybe 20 or 30m ahead of me, and there was perhaps only another 75m of open tarmac between them and the riders beyond. 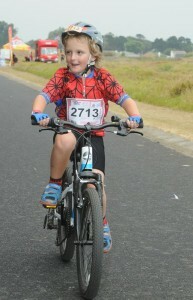 We’d catch and pass them long before the route swung left off the free-way and wound through Muizenberg. I could feel the early exertion in my legs, but sitting in our bunch they were loosening up nicely again. Even at these speeds, with the effort being shared, I’d easily ride out any remaining tightness by the time the few small ramps of the Simonstown section started and the next proper climb over Smitswinkel. The slight breeze shouldn’t bother us for long either – everything looked set for a fast and enjoyable day. And then, a mistimed moment of ill-thought out celebration brought my ride to a bone-crushing halt. I vividly remember passing under Ladies Mile bridge and soon after a lady rider in front of me took her left hand off the bars to wave to someone in the crowd. On it’s own, it shouldn’t have been an especially dangerous move – we take our hands off all the time to reach bottles, snacks, etc. But on this occasion, as she did so the words “Oh no!” flashed into my head – something about her move looked somehow uncontrolled. She veered right – not by much, and not by enough to be a direct problem for me, sitting a little back of her wheel. But before there was time to heave a sigh of relief, the other half of the problem crept into the peripheral view on my right. A Tandem (red I think) was passing us, and as they did so cut in left slightly. Again, their deviation was not by much – just enough to meet the path of the waving lady rider ahead of me. Time becomes disconnected at this point – the remainder of the incident happened in an instant, but there’s a slow motion like clarity to the last few frames of the movie playing out ahead of me. The lady ride collided with the Tandem, and then bounced back left again. At some point she and her bike went down. In one of those frozen moments I remember looking down at it laying fully 90 degrees across my path. The gap between us at this stage was less than the length of a standard 30cm ruler but I recall almost casually taking in the details as it lay there blocking my path – seeing the frame (white I think) and forks lying in front of me, as I closed in on the still spinning wheel (rear I think). The last actual memory I have is a last ditch attempt to bunny hop over it – clearly a poor piece of decision making, although I doubt a swerve around would have been any more successful. I have no idea if I even left the ground, or how much of her bike I managed to clear (if any). My next memory is coming around beside the road, an ambulance already at the scene and tending to the lady rider. One of the crowd (I later learned his name was Steve Bailey) was helping me sit up – I vaguely recall a camp chair, but I’m not sure if I sat in that or just on the verge beside the road. I’ve no idea how long I’d been out, but judging by the bruise on my head, I’d either been knocked out or at least shocked so much that nothing comes back to me about the actual fall. In SMSs we exchanged later, Steve reminded me that I’d asked him if the bike was OK enough for me to carry on and finish the ride. Neither he, nor the medics, were having any of my foolishness though – the latter confirming my collar bone was broken as they packed me into the ambulance, along with the lady rider, and took us to hospital. I’ve no idea whether we were the only two fallers in that incident or if others came down in the crash. I do remember being very worried about my bike – and hearing Steve say “don’t worry, I’ll keep it safe for you” as they wheeled me away. I must have given him my cell number as, true to his word, an hour or so later as I sat in ER waiting for a verdict on the X-rays, he messaged me to confirm details for Yoli to collect it. 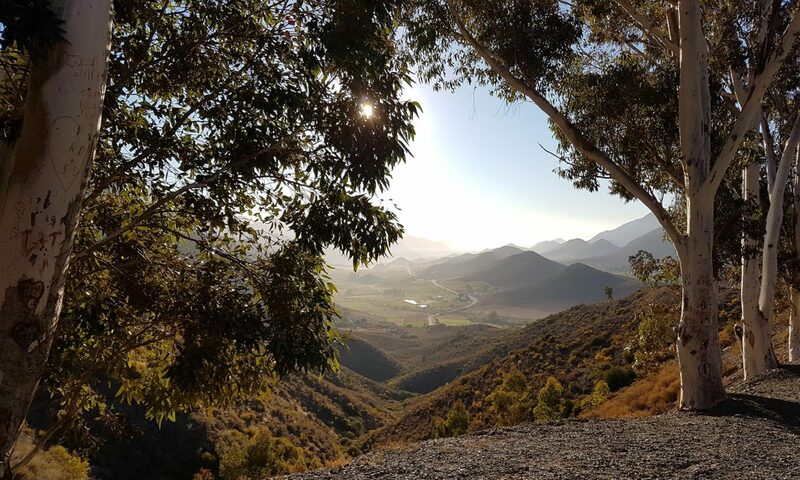 It might seem odd to talk about good luck at this stage, or why South Africa remains such a wonderful country despite the best efforts of government to undermine it. But it feels appropriate. Somewhere before 8am I suffer a crash that knocks me out, breaking a collarbone and some ribs. 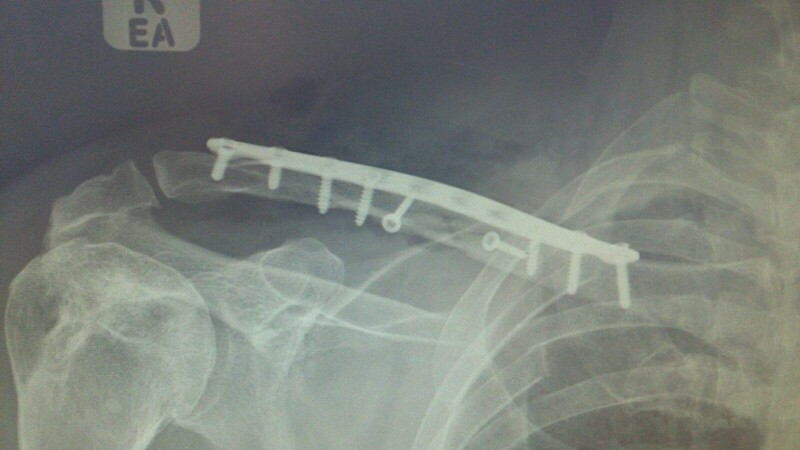 Over the course of no more than four or five hours I am X-rayed, seen by a top notch surgeon, operated on by that same surgeon to fix the collarbone with a Titanium plate, and come too on a ward recovering. Not only that, but I leave a high end bike in the hands of a total stranger met by the roadside who takes great care of it, and returns it safely. Say what you like about our country and it’s challenges, but it is also home to some truly wonderful people. 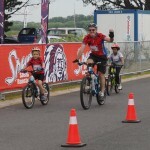 I haven’t even looked at the official photos from my ride – nor am I likely too. The “before“and “after” ones taken by Constantiaberg X-ray department really sum up my Argus of 2016. And then of course, there is the obligatory Strava log – which confirms a couple of mildly amusing facts. First of those is that I was travelling at 39.1km/h when the crash happened – which is also quite lucky, as Blue Route speeds in places can easily reach double that. Second of those is that my Argus ended up barely any longer than Ben’s. I clearly should have learnt from his lesson and avoided the crazy crowds. 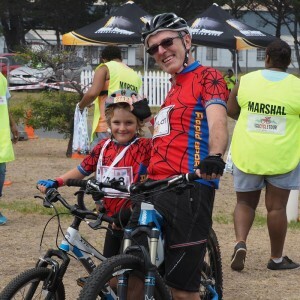 All of which begs the question – do I want to ride Argus again and, if so, would I enter with such unquestioning enthusiasm? At this stage, I’m just not recovered enough to be able to answer that objectively. Sitting here, mid-morning a week later, when the pain is at it’s lowest I can stand back and say (quite truthfully) it is one of the most scenic cycling events in the world and of course I will. But later in the day, as the pain starts to wind up, spreading from the side of my face, down my neck, and through my shoulder and ribs, it’s hard to be so definite. Luckily, if experience from Audaxing, PBP, and LEL has taught me anything it’s that the mind can deal with the pain – you just have to give it something else to dwell on. Fortunately, I have some inspiring and motivating cycling adventures in the pipeline. The planning and logistics for those should keep my mind nicely distracted until I can get back on the bike and training again. I was thinking to come over tomorrow with your medal Rob (will text to confirm, will be around late morning) as I didn’t make it this week and was thinking ‘poor you you will have to tell me the story AGAIN! But you see, blogs are wonderful, now you don’t have to! What a story. Thankfully in my slow sucker league 6G things are far more peaceful, but my personal impression this year is that there were far more accidents and incidents than the 5 Argus’s I’ve done before! (The Cape Times says NO incidents were reported, don’t know where they get their info from, and the Cape Argus Newspaper says 20 hospitalisations of which 4 very serious). As mentioned before, got such a fright when I didn’t see your Racetec updating and immediately knew something was wrong, here’s to cycling, and to you making it out alive! 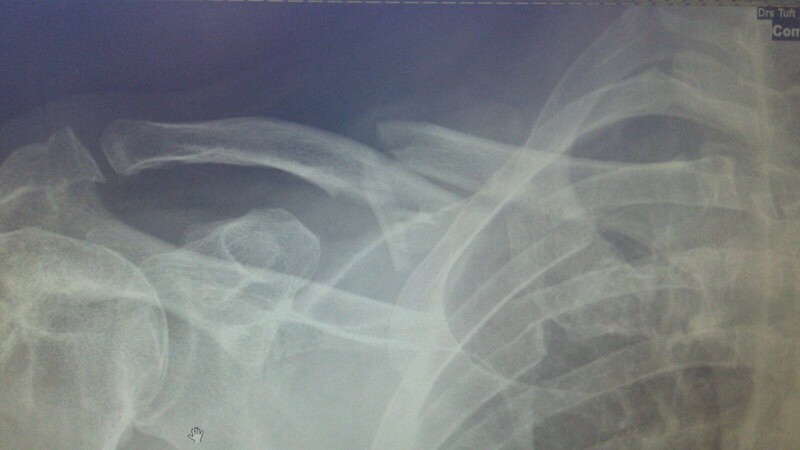 There were several people in same ward as me (mostly with the same injury – broken collarbone). Subjective impression from other guys I know who rode was that there were a lot of crashes this year. Battered as I am, I’m very glad it wasn’t worse. Well done Ben on his ride too. Yes – very true. I’m normally quite good at listening too and trusting that voice. For some reason this time I put it down as silly nerves – ignored it at my peril!